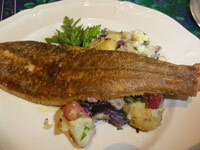 Sandabs, Rex Sole, and Petrale are three kinds of local sole. You could substitute filet of any other white fish. However, the fish will always have a better taste if cooked on the bone. Boil the potatoes in plenty of salted water until tender. Drain the cooked potatoes and leave them covered in the pan to keep warm. 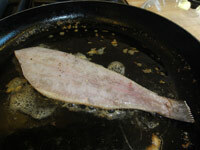 Dry the fish and put the flour on a flat plate and season with salt and pepper. Heat the olive oil and butter in a non-stick frying pan and cook the fish on both sides until golden and flakey when prodded with a fork, about 2 1/2 minutes each side. Squeeze over some lemon juice. Keep warm. Crush the potatoes with a meat pounder to break up. Stir in the capers, olive oil, lemon zest and juice. Season with salt and pepper to taste. 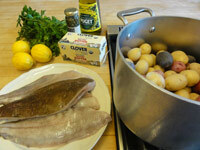 Serve on warmed plates with a piece of fish laid over the top of the potatoes. Pour over the pan juices from the fish and drizzle with a little more olive oil.